In May 2012, Japan had no nuclear plants in operation. 100% of the park was shut down in a country that drew more than 30% of its energy from this production and before March 11 was developing a highly proactive nuclear policy. A window was open and the radio project « Meanwhile in Fukushima … » was born in an attempt to capture and express that hope. Today this window is largely closed. But many people are still working to maintain this hope of May, and the sound of their work continues to be perceptible if we pay attention and try to listen. This radio program invites us to such a listening simultaneously at Maison Laurentine and at Fukushima Kitchen Garden, with the aim to promote long-term international interest in Fukushima. 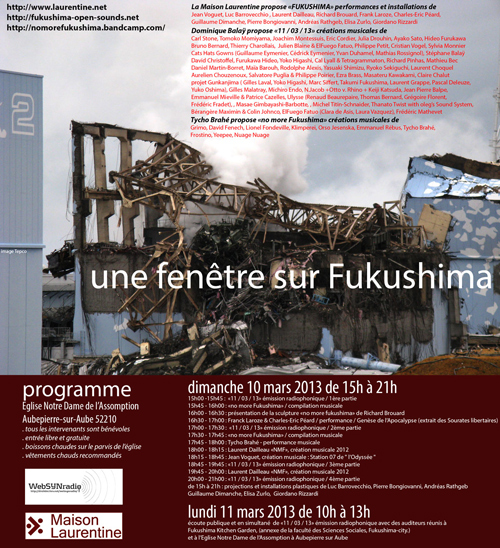 The radio program « A Window on Fukushima, 311/2013 » will be stream over partner websites of Maison Laurentine, the journal Droit de Cités and websynradio. If you also want to broadcast the program, you can apply from Feb. 25 by contacting Maison Laurentine and ask for the link source file to load it on your website. Public broadcast at Maison Laurentine and at Fukushima Kitchen Garden. Thank you to Hiroko Yasuda for her translation in Japanese.